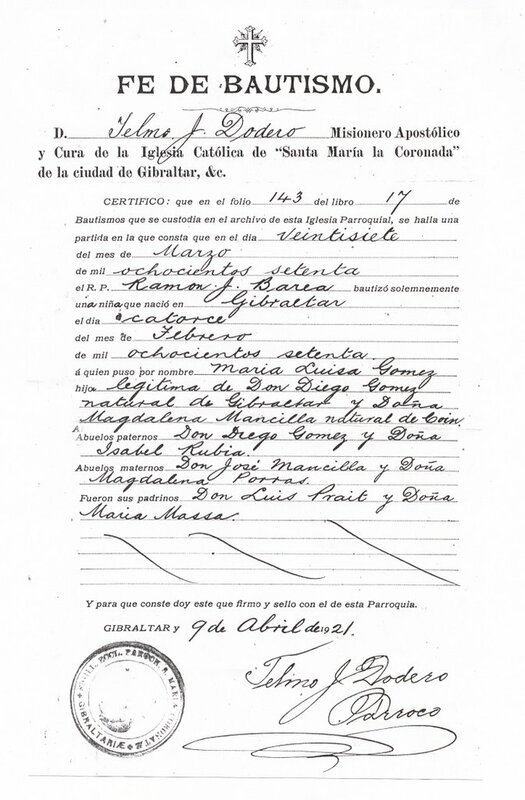 1870 It was in the rather optimistic environment that existed in Gibraltar at the time that Diego José (3.7) and Magdalena Gomez (3.8) must have decided it was time to start a family. All told they would eventually have five children, of which for only one is the exact date of birth known. 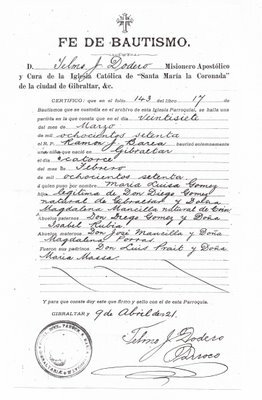 My grandmother, Maria Luisa Gomez (2.4) was born in Gibraltar on the 14th of February, almost certainly in 42 Crutchett's Ramp. 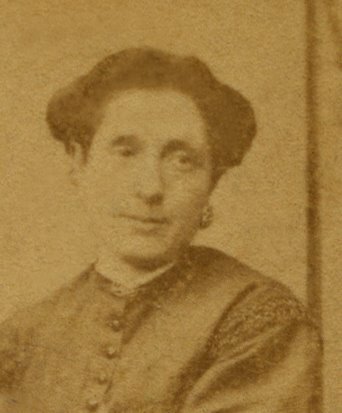 Maria Luisa (2.4) ended up with three sisters, Carmen, Mercedes and Anita, and a brother, Antonio. Little is known of Antonio other than that he must have been a reasonably well educated man by the standards of the time. St Bernard's College, which he attended, was good enough to attract pupils from well-to-do Spanish families besides the locals. Among the subjects taught were English, Spanish, French and Arabic, and Scandella himself taught the Classics. 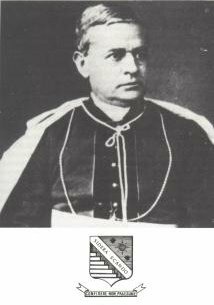 John Babptist Scadella Bishop of Gibraltar. The money must have continued to roll in from Diego José's (3.7) business as the family appear to have been reasonably well off. The household was serviced by a permanent maid, a weekly washerwoman, and an ironing lady, who used a funny sort of round iron for the stiff collars then in fashion. The homburg hat was another item that was de rigueur. In the cafes of the period waiters wore black waistcoats and ankle length white aprons. Piping hot coffee and hot milk were carried in large kettles with top handles which were swung around with amazing dexterity. They were kept warm in bain-marie to avoid having them boil over. Regulars to these cafes, of which Diego José was undoubtedly one, hired bootblacks on a monthly basis. Waterport gate from the Market side. This is a turn of the century photograph. Note homburgs. 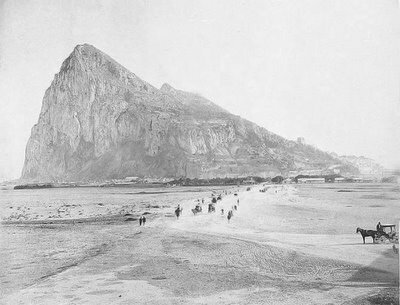 Such scenes were to continue in Gibraltar and La Linea well into the next century. That year the Spanish Government minted a silver dollar, a duro coin worth five pesetas, depicting a maiden representing Spain reclining by the sea. She offered olive branch to the unmistakable shape of the Rock of Gibraltar. The British made no response. The Spaniards then produced a copper coin of one-hundredth the value of the first. On this one the maiden held the olive branch behind her back. Later when the two coins were closely inspected it was noticed that the first had more olives than the second. Some local wits suggested that the Gibraltarians had picked a few off the branch while it was still on offer. 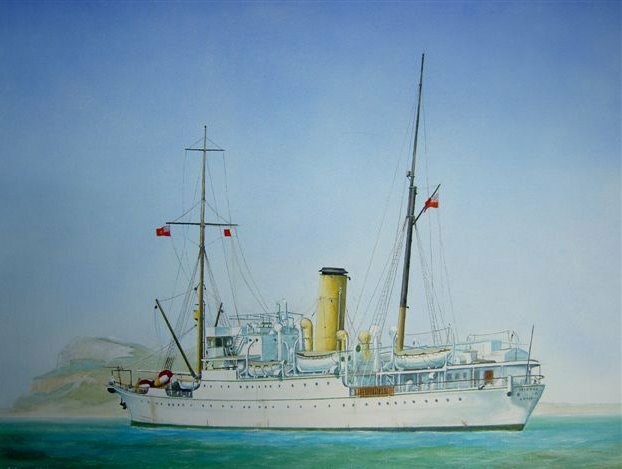 Some time later General Sir William F. Williams of Kars became Governor and cable ships began the task of connecting England to the East through Gibraltar. 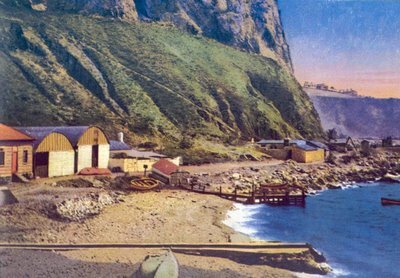 A Cable Depot was set up at Camp Bay. Camp Bay Gibraltar. This small bay eventually served as a base and second home for pioneering cable ships such as the Mirror and the Amber. 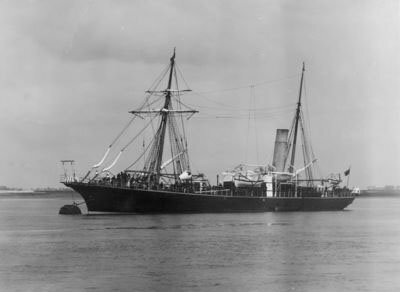 The Amber, one of the pioneering cable ships. 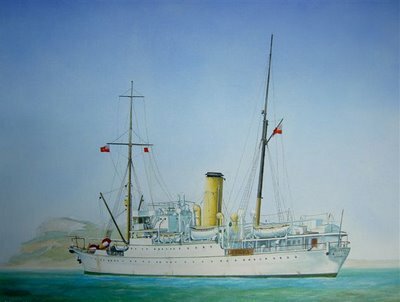 Painting of the cable ship Mirror as she approaches Gibraltar. 1871 The civilian population decreased to 15 340 as the depressed economy continued to bite. Things were getting worse despite the increase in ship traffic due to the Suez Canal. A report by the Attorney General to the Governor on aliens states that 7 877 people out of a 'native' population of 10 116 were out of work. 1872 One fine morning the following year an event occurred that probably took people's minds off their troubles for a while and became the source of endless gossip and speculation for a long time afterwards. 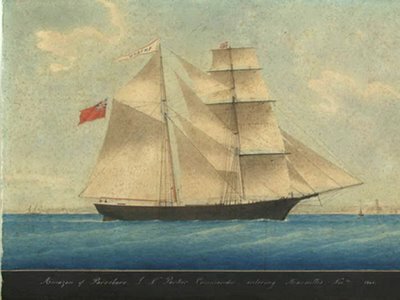 The Mary Celeste, a 282 ton brigantine registered in New York was brought to Gibraltar by the vessel Dei Gratia. She had been found some 600 miles west of Gibraltar with some sail set but without a soul on board. She was carrying a cargo of alcohol destined for Genoa. Her skipper, a certain Benjamin Briggs, was apparently well known in Gibraltar. 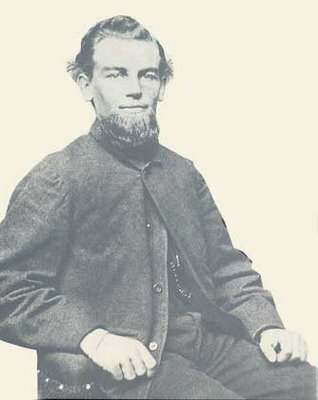 Benjamin Briggs, skipper of the Mary Celeste. Everything seemed to be in order. The bunks had been slept in, clothes were hanging on the lines, and there were no signs of violence, fire or explosion. The ship's chronometer, sextant and papers, however, were missing, and the ship's boat had been launched. The last entry in her log had been made ten days before she was found by the Dei Gratia. She was taken to Gibraltar and her cargo was claimed as salvage by Captain Morehouse of the Dei Gratia. While in the custody of the Admiralty Prize Court, the vessel was examined and some spots that appeared to be bloodstains were found on the deck planking and on the blade of a sheathed cutlass. The Port Medical Officer analysed the spots, disproved they were bloodstains and wrote a report on the whole mysterious affair. Over the years a great number of explanations for the mystery have been put forward, but none has proved conclusive. 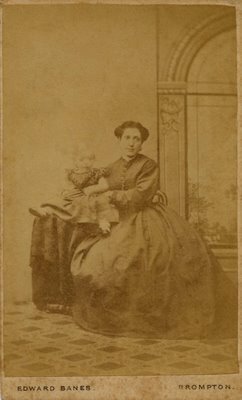 Photos of Rosa Letts (3.6) and her two year old son George (2.3) taken in London around this time suggest that the family may have moved back from Canada to Britain. Rosa Letts Bottaro (3.6). My great grandmother was probably about 25 years old at the time. My guess is that her life as a soldier’s wife in Montreal was over and that she and her family would shortly return to Gibraltar. Rosa Letts Bottaro (3.6) with her son George Letts (2.3). George (2.3) was my grandfather. The photograph was taken in Brompton in Kent by Edward Banes. At the back of the photo it states that he was ‘Patronised by the Army and Navy’ and that he was a ‘Practical Chemist and Photographer’. 1873 Meanwhile an 'Aliens Order in Council' laid down that Gibraltar was a fortress and that no-one could claim right of residence on the Rock. The locals, long accustomed to all sorts of arbitrary regulations from both the military and civil authorities took the pronouncement with a pinch of salt. In any case there was little they could do about it. Of far more importance was the failure of an attempt to introduce a tax on tobacco. By now some 4 500 tons of tobacco on average were being landed on Gibraltar annually. 1 500 people depended on the trade. 1875/6 Two year later the Convict Establishment came to an end. This was done for economic rather than humanitarian reasons. A free Spanish worker could do twice as much in a day as a convict and the cost of his wages was less that that for keeping a convict alive and under surveillance. The population of La Linea began to increase and became in effect the industrial working-class shanty town of Gibraltar. 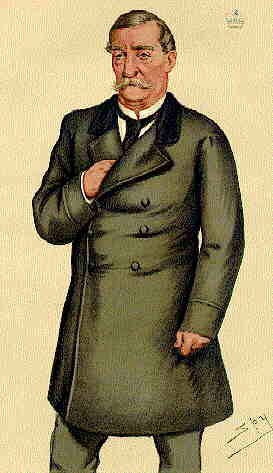 In Britain Disraeli bought controlling shares in the Suez Canal. It augured well for the Rock as the short route to India was now through Gibraltar. Somewhat appropriately General the Lord Napier of Magdala was appointed Governor. 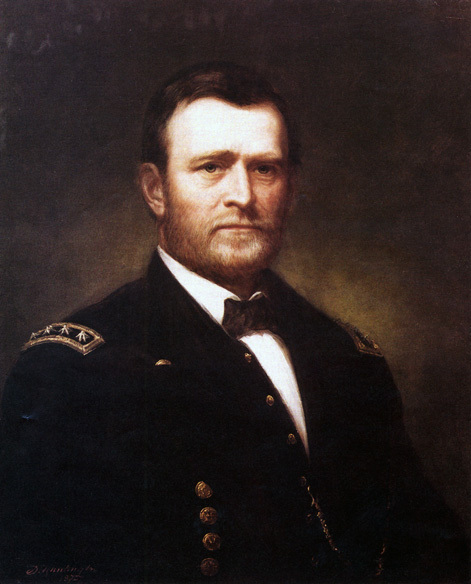 This gentleman had distinguished himself during the Indian Mutiny and ended up as commander-in-chief in India. He was raised to the peerage following an expedition to Ethiopia in which he captured Magdala. His Gibraltar appointment was considered a fitting finale to his military career. A report by Mr. Reade, the British Consul in Cadiz, to Lord Napier stated that at the time there was four times as much tobacco coming in illegally to Spain through Gibraltar, as was purchased legally by the Spanish Government. Lord Napier ignored the report and turned his attentions towards the removal of several farms and orchards situated in the Neutral Grounds as it was believed that they were the sources of various infections. In their place large ornamental gardens were laid out which were patriotically named the 'Victoria Gardens'. Shortly after the military establishment came up with the idea of building a racecourse in order to do something more exciting with their horses than just ride them backwards and forwards. Spanish cooperation was sought and was quickly forthcoming. The racecourse was duly completed and competition was provided by horse breeders and ranchers of Andalusia as well as by Spanish military officers. Among the various plots of land which gave way to make room for these grandiose schemes was 'La Huerta Fava', a small orchard owned by Memo's (2.2) family. Not long after its destruction the family started a new orchard in La Linea but very little is known about either its location or its size. Presumably both the original and the new 'Huerta' were little more than allotments. 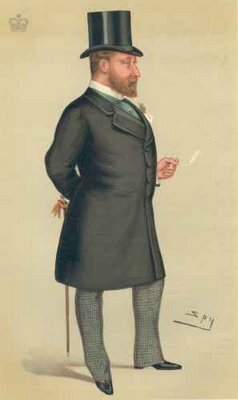 Nevertheless, nearly a hundred years later, by which time the Victoria Gardens and the racecourse had also ceased to exist, the name 'Huerta Fava' was frequently bandied about in conversation by the family on odd occasions. It must have meant something to some of them. The north face of the Rock from the Neutral Ground. This is a more or less contemporary photograph. Although neither the Race course nor the Victoria gardens appear on it they would have been somewhere behind the plants that appear below the rock in the middle distance. The Prince of Wales, later King Edward VII, visited the Rock in April. That same year saw the founding of the local Calpe Rowing Club of which both I and my brother would eventually become members.1877 Moves were again afoot to impose a tax on the importation of tobacco. Yet again the tradesmen of Gibraltar began to defend themselves. The Chairman of the Exchange Committee sent the Colonial Secretary a 'Humble Memorial ' which contained three resolutions. The first, declared that the proposed law ran counter to Queen Anne's Order in Council. The second underlined the economic implications. And the third gave full powers to the Exchange Committee to raise funds and act appropriately. Very soon afterwards the Bishop, Dr. Scandella entered the fray. He wrote a letter to Lord Carnarvon, Secretary of State for the Colonies, arguing the case againsttobacco duty. In it he cited the Protestant Irish clergy and the West Indian slave-owners as two precedents to those who had lost their livelihood through legislation. It is perhaps an indication of the morals of the era that the good doctor, who was by all accounts a humane and decent individual, saw little that was wrong with his arguments. Messrs. Pirrie, Foote & Co. from Glasgow and the Chambers of Commerce of Manchester and Liverpool weighed in on the side of the Gibraltar Merchants with lengthy letters to the Secretary of State. 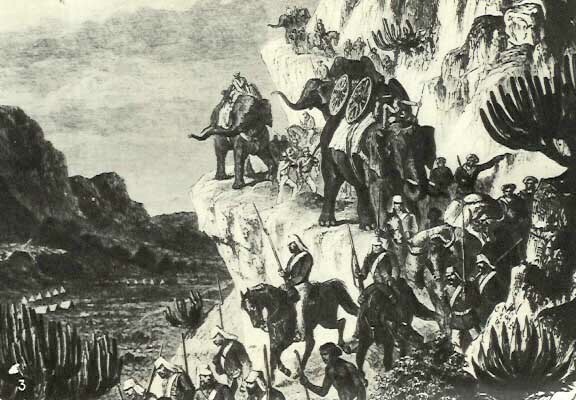 In July Lord Carnarvon met a delegation of local worthies but the meeting was inconclusive. That spring, after the close of his second term as president of the United States, Ulysses Simpson Grant set off on a journey round the world accompanied by his wife and one of his sons. He called at Gibraltar and was regally entertained by the Governor at a banquet in St. George's Hall, the chamber which Sergeant-Major Ince had mined inside the Notch. 1878 Lord Napier now wrote to Whitehall suggesting that 'smuggling had apparently very materially diminished of late.' He had, he said, instigated several local regulations to hinder it. He was sadly misinformed. Lord Carnarvon promptly postponed the Customs Ordinance on tobacco, the one regulation which would have had any serious effect. Civilization as we know it, however, did not come to an end and there was some advancement for at least one section of the community. 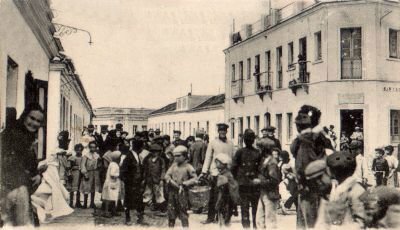 The Jews of Gibraltar were admitted to the Jury lists for the first time. From then on they were to enjoy equal citizenship with the rest of the population. In January, thanks to the apparently tireless efforts of Dr. Scandella, the Christian Brothers returned to Gibraltar and began teaching at Castle Ramp School. Shortly after that they opened a pay school at Commercial Square. But there were also one or two reactionary steps. 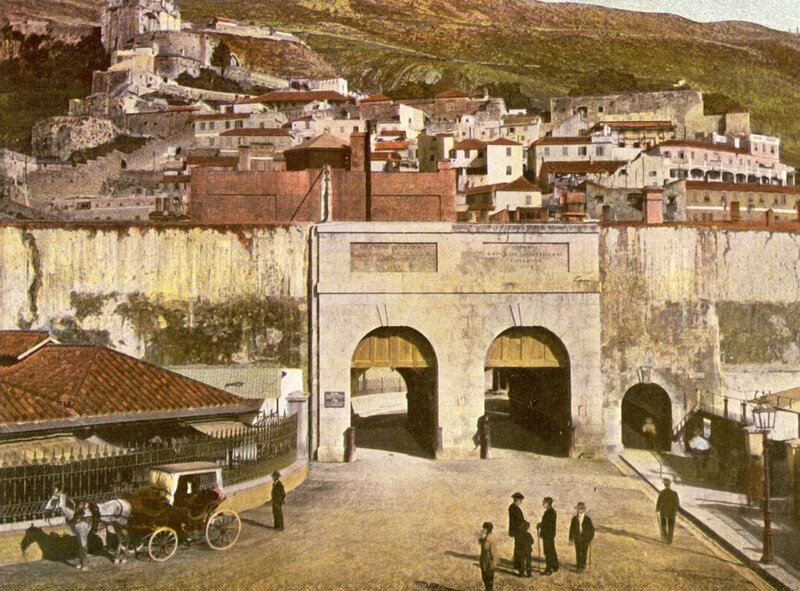 During the 1850's a number of Maltese had immigrated to Gibraltar, to tend goats on the Upper Rock. For a time the Rock took on a strange appearance as the upper areas became denuded of vegetation as vast herds of goats overgrazed the area. But not for very long as the Maltese soon discovered the possibilities of the Free Port system. The leading citizens of the Rock, including the Vicar Apostolic, Dr. Scandella, were up in arms. They petitioned the Governor to prohibit the entry of any more Maltese. They were, they said, 'the scum of that people.' The reality was that the richer citizens of Gibraltar resented this new intrusion into their prosperity. 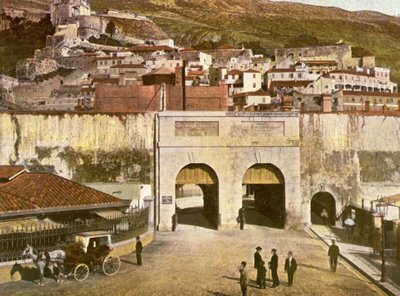 The petition checked the flow, but names such as Mifsud, Zammit, Xerri, Wahnon and Azzopardi are still common today in Gibraltar and it is pleasant to record that the new immigrants were soon completely absorbed into the community.